Family Tree DNA's 9th Annual International Conference on Genetic Genealogy was held this past weekend in Houston. It was clear to those in attendance that, with the recent acquisition of Arpeggi, things are changing over at Gene by Gene. There has been an infusion of "new blood" into the company and with it has come new enthusiasm, resources and promise. The team was very open to hearing the community's needs and priorities, with the new staff listening in on our "roundtable" discussions where attendees were encouraged to share their ideas. As a result, they have promised the genetic genealogy community some of our most requested features in the near future. These are exciting times for our Y-DNA citizen scientists! Following right on the heels of the delivery of the first results from Full Genomes, Family Tree DNA announced their new Big Y next gen sequencing product at the conference. Justin Petrone covered this development in his article in BioArray News yesterday as have a number of genetic genealogy bloggers. In all of this excitement there has been a lot of discussion regarding what these competing products will and will not deliver. For the answers to many of these questions, we will have to wait until the first Big Y results start to be returned in approximately 10-12 weeks. However, one of the most pervasive concerns can be addressed now. Throughout the genetic genealogy community for the last couple of days, there has been speculation that Family Tree DNA's Big Y product will not include raw data downloads. I found this very difficult to believe with FTDNA's track record of transparency, so I asked Gene by Gene's new Chief Scientific Officer Dr. David Mittelman for clarification on this matter. He confirmed that, while the Big Y results will consist of SNP calls, the raw data will be available for those who want it - just as it is for the company's exome and whole genome products. He added, "We will want to set up some infrastructure to support downloading these big raw files and we will need to clarify for customers that our CSRs are obviously not able to offer advice or support on how to use them." I am relieved (although not surprised) to hear this, as I am sure many of you are. I appreciate Dr. Mittelman's quick response to my inquiry even though he was traveling. When I first started blogging the FTDNA conference, I was largely alone. Now with the excellent and thorough conference coverage by other bloggers and on Twitter, it is no longer necessary for me to give a blow-by-blow account here. Thanks to Debbie Kennett for compiling a comprehensive list of conference posts on her blog. November 8, 2013 - Adoption Knowledge Affiliates Conference, Austin, TX. Due to recent technological advances, adoptees and individuals without knowledge of their genealogy are increasingly turning to DNA testing to discover their genetic roots. The tight-knit AdoptionDNA community has been in the forefront of innovation in this area, helping many adoptees rediscover their birth families and ancestral origins. Attendees will learn some of the techniques and tools successfully used. November 14, 2013 - Diamond Gateway Women's Club at 6:30pm, Penasquitos, CA. Reservations required, contact Dael at 619-252-0804 or daelnk612@yahoo.com. There is a $5 fee. Mt. Carmel Church of the Nazarene, 10060 Carmel Mt. Rd., San Diego, 92129. For those wondering what the results from Full Genomes look like, here’s a first look. After a long wait while my kit was sequenced and analysed, I finally received an email from Full Genomes with an attached rar archive containing 9 files. 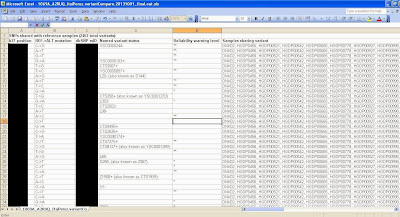 Almost all these files are in a formatted text format, and can easily be converted to an excel table (which I did). This one is easy to understand. 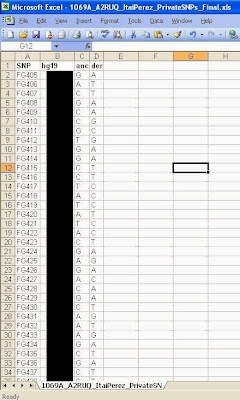 It is a list of all Private SNPs discovered in my sequencing. 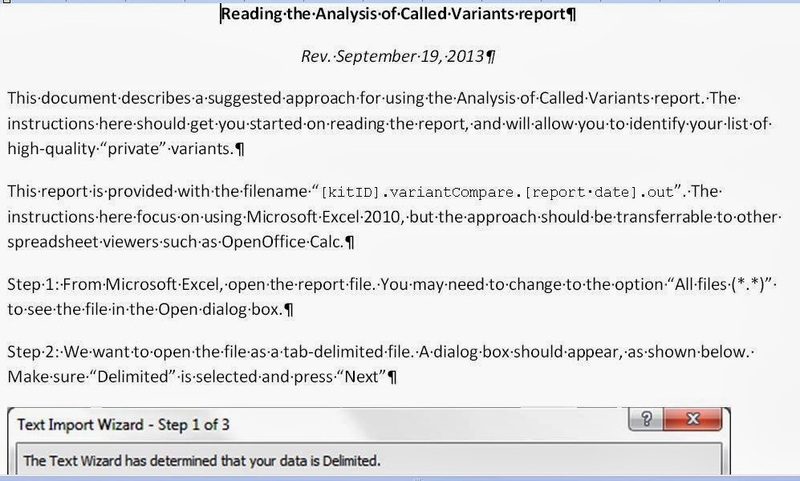 Here is the description found in the beginning of the file (which I removed when converting to Excel). The columns are SNP name, position, ancestral and derived base. The position of these new SNPs have been removed from each image in order to give the Full Genomes team time to register and name them. This is the only file which is not a table. This text file includes a tree, following my positive SNPs from Y-Adam to my current most recent SNP, as defined in the ISOGG Y-tree. GRCh37 is the Genome Reference Consortium human genome (build 37). I guess it is a reference genome similar to CRS or RSRS for mtDNA. 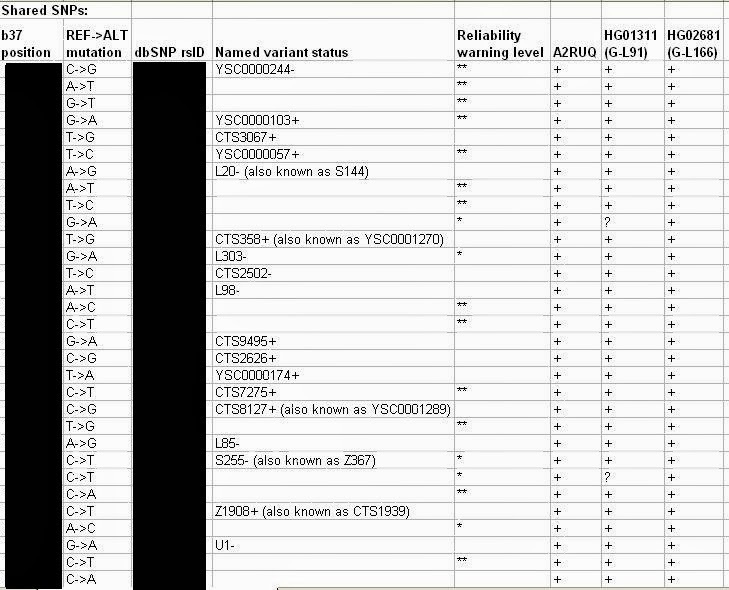 This table lists all the SNPs which vary from this reference. The fields are position, base change, rsID, SNP name, reliability and a list of the reference genomes which share this change. There are four successive sections: shared SNPs, private SNPs, shared INDELs and pricate INDELs. 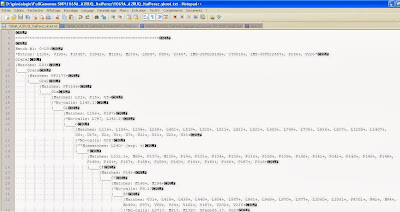 This table contains the list of all STRs. #lobSTR citation: Gymrek M, Golan D, Rosset S, & Erlich Y. lobSTR: A short tandem repeat profiler for personal genomes. Genome Research. 2012 April 22. Now this gets very technical and I don’t understand everything, but from what I can figure out, first we have the STR name and the estimated result, and then follows information explaining how this result was found and how sure the program is of it. This table also lists the STRs, but in a much simpler form. You simply have the name and the results, and the STRs are in the order they are found at Family Tree DNA. #see main Y-STR report for further information regarding reliability, etc. 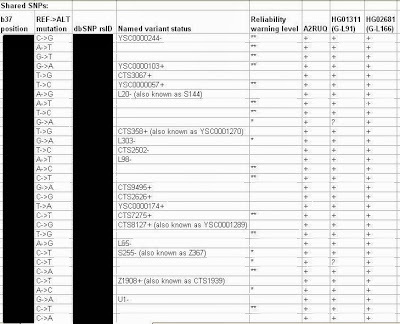 This table gives the mtDNA results in RSRS format. It gives for each SNP the position and the ancestral and derived result. This one is exactly the same, but using the CRS format. 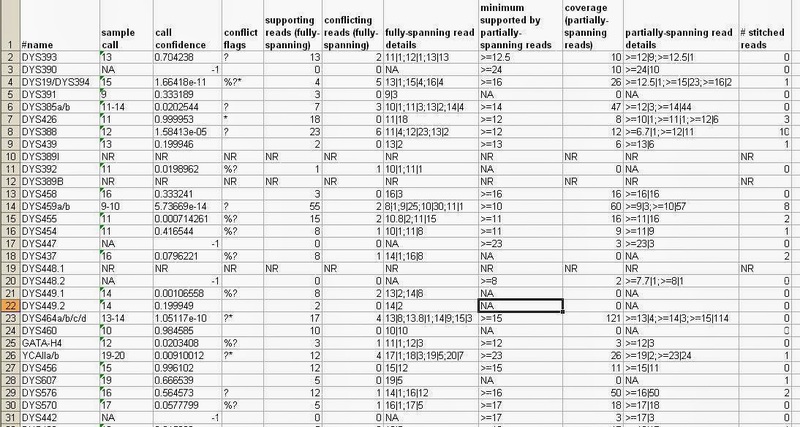 This table lists my SNPs and compares them to some reference results from my haplogroup or close to it. It quite similar to the variantCompare file. 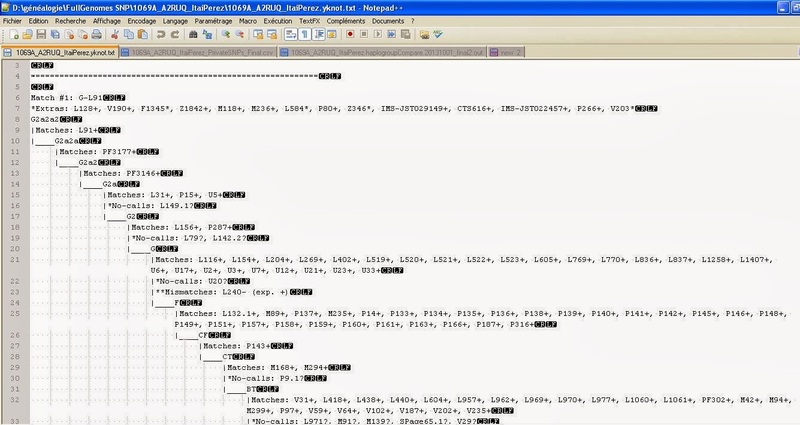 The fields are position, base change, rsID, SNP name, reliability and the reference results mine is compared to. There are two successive sections: shared SNPs and private SNPs. This one is also a bit complex. 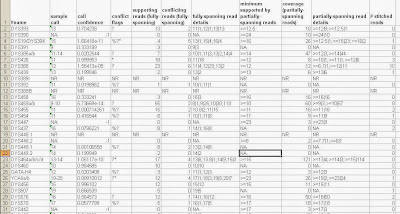 It lists the Y-SNPs and seems to detail how the results were determined. 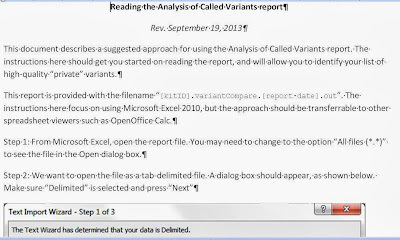 This ends the description of these nine analysis files. Note that I am still waiting for access to my results on the website and to my sequencing raw file. If you are interested I’ll write another article to show it to you then. These tools were developed by Dr. Greg Magoon with the supervision of Justin Loe. Justin tells us "these are not final versions and will be upgraded to a more user-friendly presentation by specialists in user-interfaces." BGI provided the sequencing services and developed the Y chromosome chip.